This event took place on this day in the year 438, when Saint Theodosius the Younger had been Emperor for thirty years; he was the son of Arcadius, and Eudoxia, who had exiled Saint John. The Archbishop of Constantinople at that time was Proclus, who had been the Saint's disciple (see Nov. 13 and Nov. 20). The holy and august Church is mystically gladdened today on the translation of thy holy relics. And though she had kept them hid in concealment like precious gold, by thine intercessions she unceasingly granteth, unto them that praise thee, the divine grace of healing, O Father John Chrysostom. 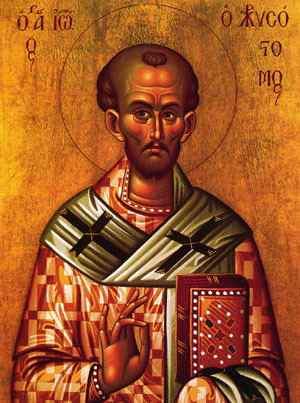 Share the feast of Removal of the Relics of John Chrysostom, Archbishop of Constantinople with an icon greeting ecard.